Vegetarian Appreciation Day for Emily! Monday was declared Vegetarian Appreciation Day at my house. The day was in honor of vegetarian daughter Emily who created this blog for me. Thank you, Emily. 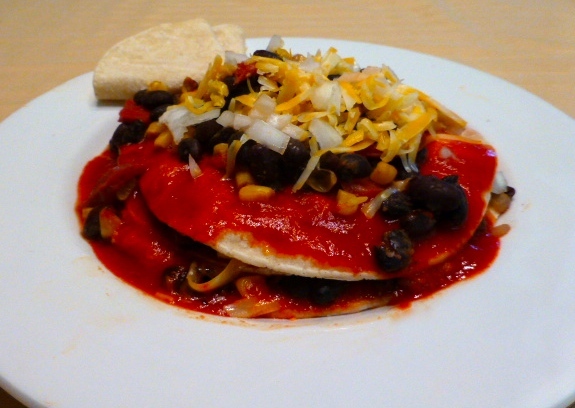 A late breakfast of corn and blackbean enchiladas got the day off to a good start. A light lunch of pears and blue cheese got us through the afternoon. Delicious but not photogenic. 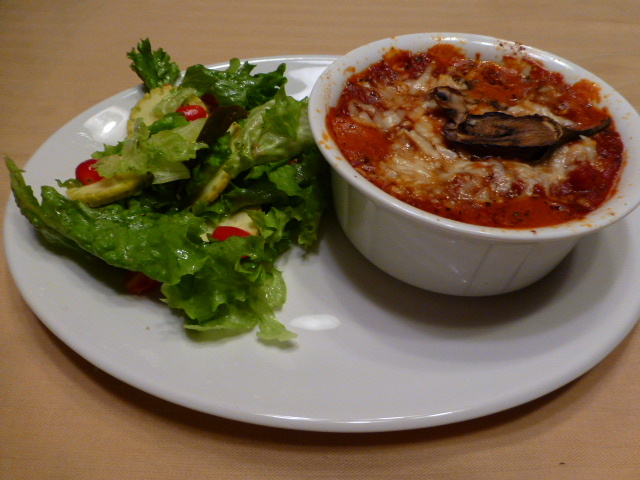 Dinner was a vegetarian lasagna and a salad. I like to use wonton wraps instead of noodles in the individual lasagnas I make. I cut the wraps to fit the ramekin. Layer one was pan grilled Indian eggplant. The tender morsels are about the size of a chicken egg. They are good halved and grilled or, thin sliced on a mandoline and pan grilled with a little olive oil. Next was a thin layer of cottage cheese on the eggplant, some fire roasted tomato sauce over the cheese and a wonton wrap. Then came thin sliced yellow squash, more cottage cheese and tomato sauce and a second wonton wrap. The top layer was sweated cremini mushroom slices and the mushroom liquor and fresh grated parmesan cheese and a final wonton wrap. More tomato sauce on top of it all, a heavy handed sprinkle of parmesan cheese and a garnish of sliced mushrooms and a slice of eggplant. As I put the ramekins in the oven, I remembered I have spinach in the fridge. That would have been good wilted in the tomato sauce. Next time!!! I make the individual lasagnas frequently for the two of us. Its a satisfying serving and the wonton wrap layers are “pasta lite!” You can layer anything you want in the dish, bake in a 350 oven until the sauce bubbles and the cheese browns. P.S Tuesday was declared Bacon and Eggs Appreciation Day. Bring two small pots of water to a boil. Put nopalitos in first water and boil until 30 – 45 seconds until water begins to thicken. Drain well and repeat is second pot of water. Drain well and rinse with cold water. Do not overcook. Combine nopalitos with jicama, jalapenos, bell pepper, cucumber, chives, mint and cilantro. Stir into nopales and jicama. Toss with a raspberry vinaigrette dressing. Serve on fresh greens. Sift or fork-sift dry ingredients until well distributed. Add liquid ingredients and stir until well blended. Batter will be thick and fluffy. Spoon or pour batter into waffle maker. Remember, the batter will expand as it cooks so don’t overload the maker. Cook until steaming stops or the waffle maker indicator light comes on. Remove waffle carefully and place on a wire rack while you cook the rest of the batter. Left over waffles can be wrapped in plastic wrap or foil and frozen for later use. Place frozen waffles on a baking sheet in a 400 degree oven for about 8 minutes to thaw and crisp up. Mesquite waffles are delicious with honey, Greek yoghurt and toasted pecans or walnuts. They are also very good with butter and maple syrup. I used Greek yoghurt, pomegranate molasses, pomegranate seed and toasted walnuts the last time I made them and will be doing that again! I also plan to freeze pomegranate seed to use when they are not in season. Mesquite flour or meal contains no gluten. It needs to be combined with other flours if you expect it to rise. Mesquite is about 25% dietary fiber. It has a rich nutty-sweet taste that can be overpowering. It is best used to replace a portion of the traditional flour in your baking recipes. Recommendations for using mesquite flour in baking are 5% in biscuits, 10% for breads, and 15% for pancakes and muffins. It will cause baked goods to brown considerably, so don’t think you’ve overcooked what you are baking. 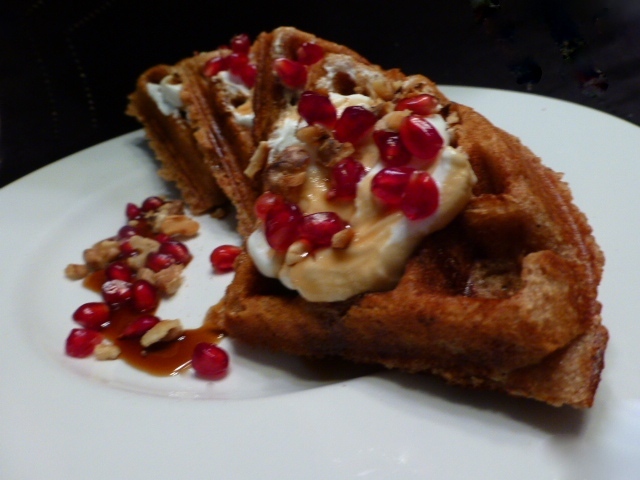 Waffles made with mesquite meal, whole wheat flour and unbleached wheat flour topped with Greek yogurt, pomegranate molasses and pomegranate arils make a delectable breakfast. Look for the recipe in the Recipes Category on the home page. Sometimes a glimpse of something on a television show makes your mouth water. I saw Mario Batali make Arista Toscana and knew I had to do it! Tomas at my supermarket’s butcher block agreed to cut me a 10 bone pork loin roast and French it for me. Tomas is learning meat cutting and I think he likes it when I challenge him. He did a great job on the roast. The roast was placed on a bed of garlic paste topped by mixed chopped fennel (three bulbs) and onion (four). After salting and peppering, the roast was covered with fennel pollen and a drizzle of olive oil. Whole milk and more olive oil were added to the roasting pan. It was cooked at 400 degrees to an internal temp of 145. While the roast rested, I pureed half the bed of onion and fennel for a sauce. Just before serving, the roast was cut off the bones and sliced into 3/4 servings. 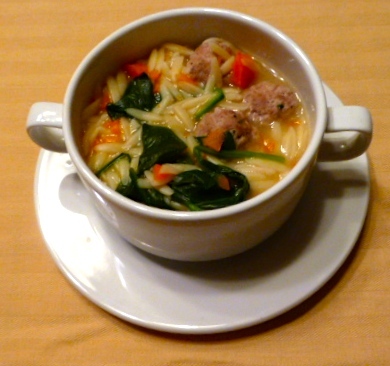 Dinner began with a take on Italian Wedding Soup – beef and pork meatballs simmered in a chicken broth with carrots, orzo and spinach. The pork roast was plated on a bed of the roasted fennel and onion and topped with a little pureed sauce and a sprinkle of freshly grated parmesan cheese and a sprinkle of fennel fronds. On the side were a fennel and Cava Cava orange salad and a Hassleback potato. Hassleback potatoes are fun to make. Clean a roasting potato. I used red skinned potatoes for color on the plate. Place the potato between two pencils on your cutting board and slice the potato at 3/16 inch intervals. The pencils keep you from slicing through the potato. Make a mix of thinly sliced garlic, olive oil, salt, pepper and paprika. Carefully poke the garlic between the potato slices and rub the potato with the spices and oil. Bake at 425 until crisp on the outside and tender in the middle. The potatoes will fan open slightly as they bake. They are attractive on the plate and very tasty! 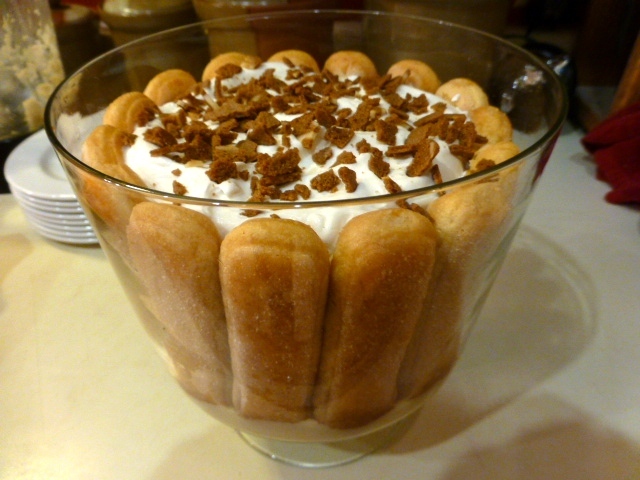 Dessert was a trifle of raspberries and cream sherry topped by almond cookie crumbles and whipped cream. Sometimes you get lucky. Finding a strip steak big enough to split in two in the used meat bin (reduced for quick sale) and little lobster tails on sale means it is surf and turn night! 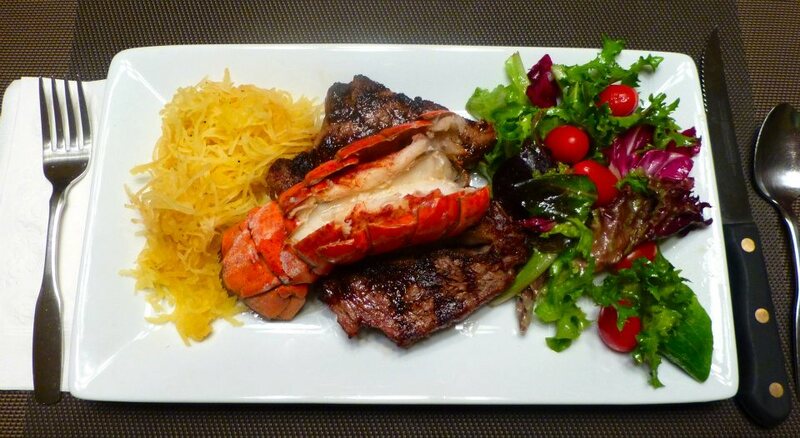 Classic grilled steak and lobster with a little clarified butter, mixed greens and the last of the spaghetti squash on a Saturday night. 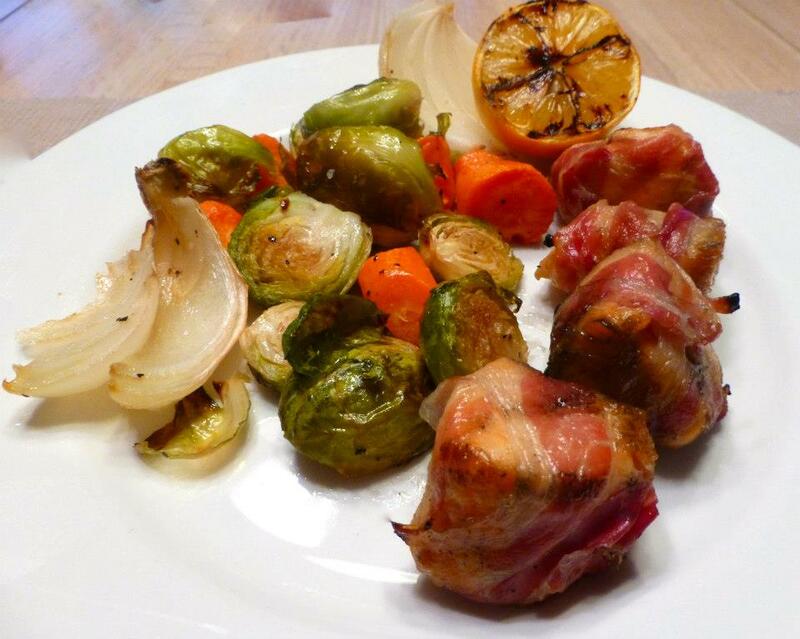 Oven roasted Brussels sprouts, carrots and onion with cubes of salmon wrapped in pancetta. The salmon was skewered and grilled. A grilled Meyer lemon was the perfect accent squeezed over the salmon. Grilling the lemon caramelizes it’s sweetness and make it good enough to eat peel and all. I love it when we can find Meyer lemons here! The Gringo Gourmet strikes. Chiles rellenos – I browned panko crumbs in the oven, stuffed roasted and peeled Anaheim chiles with cheese, rolled them in flour, egg substitute and panko, and baked them on a rack. 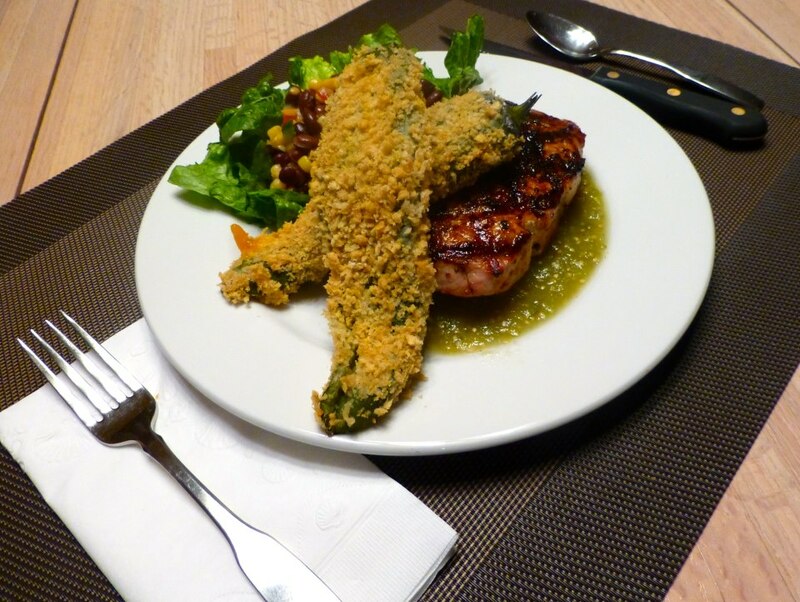 They were served with corn and black bean salad and a grilled pork loin chop on tomatillo salsa. I used Williams Sonoma chile lime rub on the chop. Delish and no frying mess to clean up! I was given a cookbook, “Bean by Bean,” featuring 170 bean recipes. This one for White Chili sounded good. 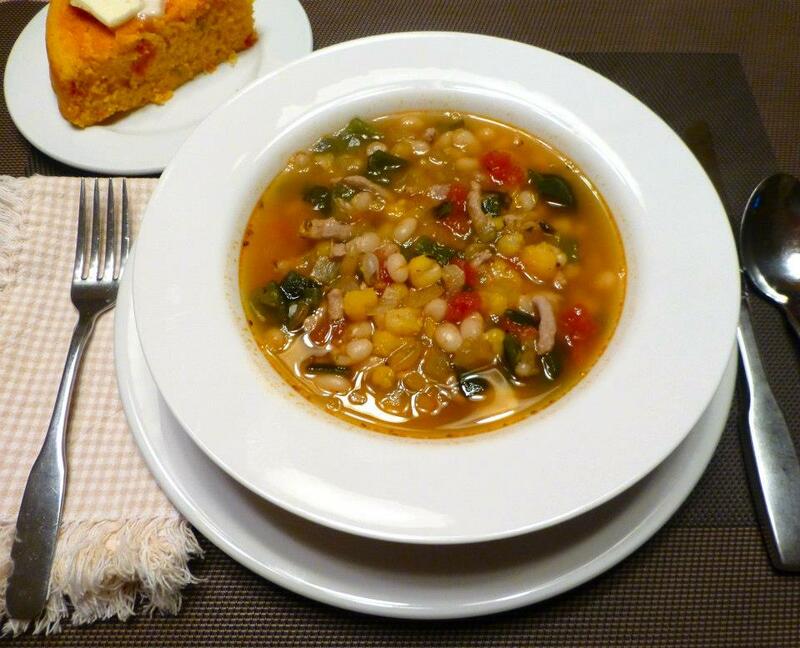 It has navy beans, hominy, poblano and serano chiles and a little Rotel tomatoes and chile, onion, garlic and chicken broth. I improved it with ground pork. And on the side, buttermilk corn bread with the rest of the can of Rotel. We’ll be exploring more from the bean book. 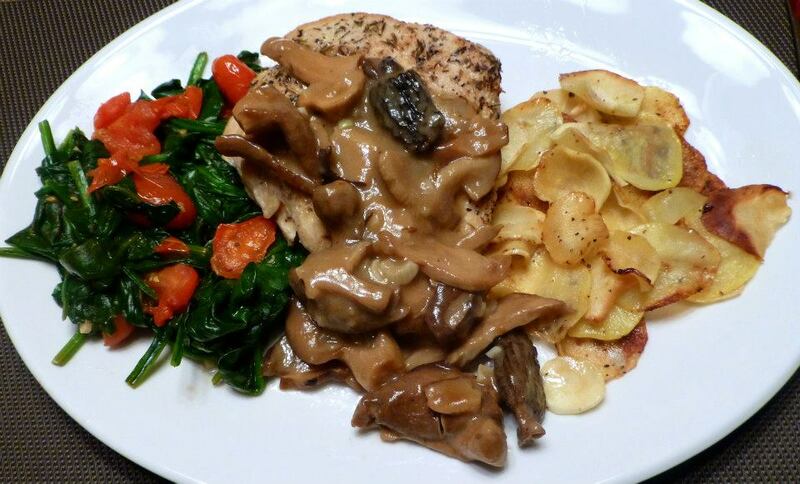 Herbed chicken breast with mixed mushrooms in a marsala sauce, served with a sauté of spinach and grape tomatoes and a galette of parsnips and potatoes and it was all under 500 calories!